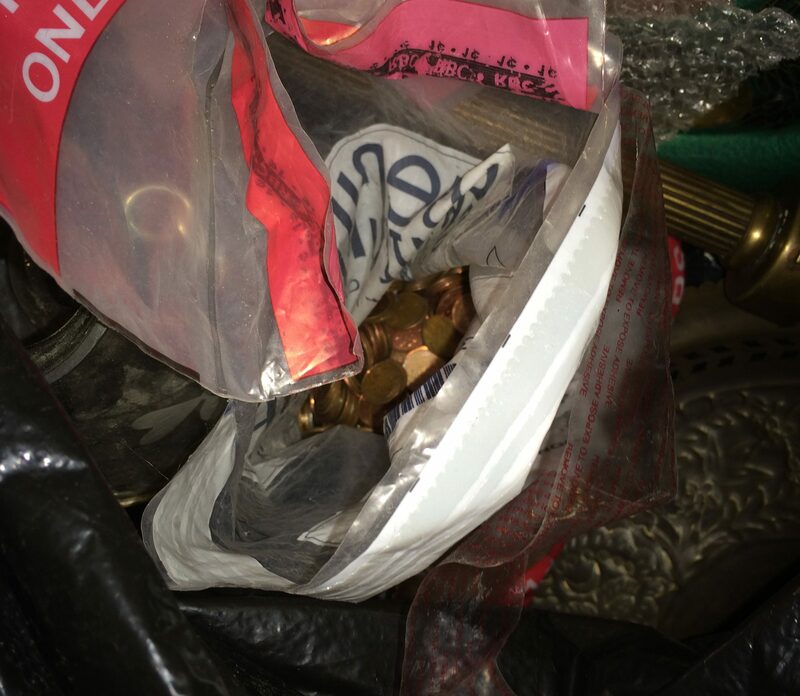 The bag contained 1062 pennies, 2 dimes, 1 nickel, 10 Dutch Antilles cents, 1 British penny, 2 small keys, and 1 button. Hurrah for your specificity!!! And for breast pockets stuffed with cash!!! Thank you for all you do — and share with us. It was. I thought about sending you the video, but I figured it’d be fun to surprise you via the blog post ha ha. As a quilter I am looking at the fabric and wondering where I would use it! Amazing that so much cash was thrown away. Question: do you wear gloves when trash picking? I was having a debate with my hubby the other day over whether I should wear gloves or not and I’d like your thoughts. I don’t wear gloves generally. I find they make it harder to untie bags, and see to the bottom of the bag (unless you get skintight ones). I also find taking off / putting on gloves annoying, especially in the summer when they get sweaty. I do have a couple pairs of gloves in the car in case I come across some particularly gross stuff, or a spot with lots of nails / broken glass. Of course if you’re not wearing gloves you have to be more careful, but I’ve never had a problem. I could change my mind at some point though, who knows. I’m firmly in the “wear gloves” camp after seeing needles 2 different times. Now I’m never without them. This is incredible.You have the Midas touch.You should check a few apartment building trash bins and recycling bins every weekend when there is no trash pick-up.In many buildings,the big plastic recycling bins and trash bins with lids on top stay outside throughout the week.In Ville St.Laurent and the francophone suburb of Ahuntsic, most apartment plastic trash bins and recycling bins are left outside the apartment buildings throughout the week so people like you can check them out.Bottle /can collectors regularly check them out. 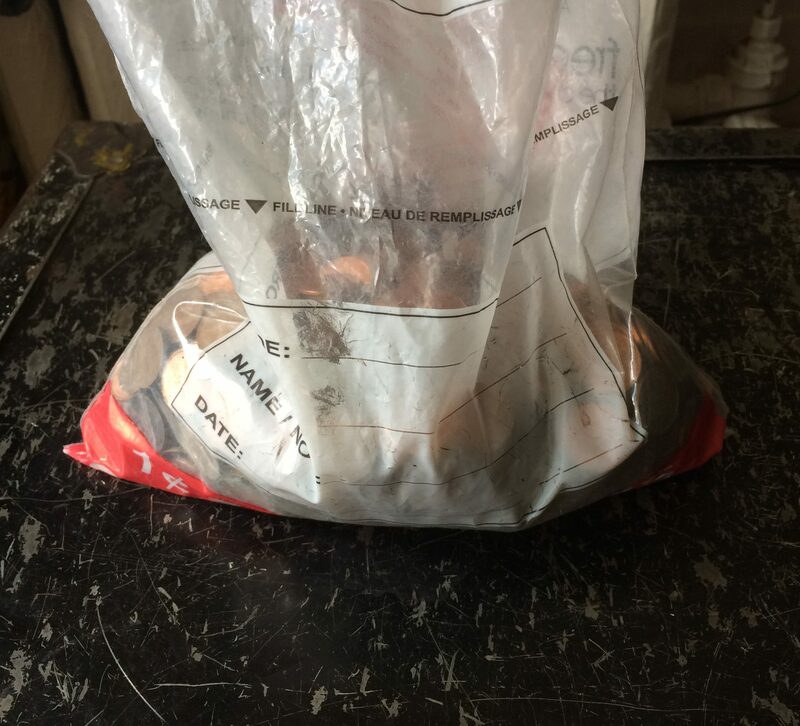 You once found great jewelry from a bin outside a Rosemont apartment trash bin.I told you once to check out apartment trash bins more often but you were dismissive,saying that there is probably not much good stuff in there. Also you should check out Ahuntsic and Ville St.Laurent more often. Lol, it’s true. There’s definitely good stuff in apartment building dumpsters sometimes. The only thing is that it’s often hard to tell if there’s anything good there just by looking at it. 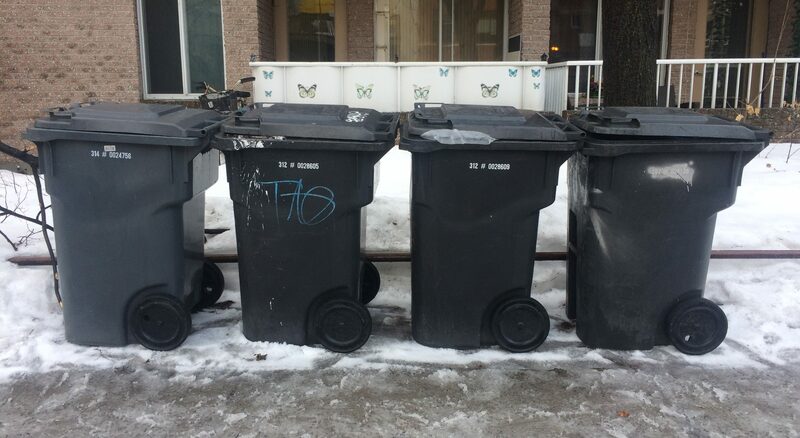 With these dumpsters, I never would have stopped while driving or biking because they looked empty from the outside. Plus, it’s way more likely that the good stuff is stuck under piles of bad stuff (especially when the buildings have chutes), or that other pickers have already rummaged through it. I prefer picking in lower density housing (especially neighbourhoods composed of mostly single family homes) because it’s easy to distinguish who the garbage belongs to, and judge the pile on its own merits. I’m a pretty good judge of trash at this point, and useful information includes the shape / “look” of the bags, the look of the actual house, the quantity of stuff, the presence of vintage stuff, and the presence of a “for sale” sign. So, I’m often able to stop for only the good garbage and avoid digging through the gross stuff (of course, I still do get my hands dirty on a near daily basis). Unfortunately, I only have so much time for picking, so I leave the apartment building dumpsters to the local can pickers, who hopefully look for other things as well. That being said, if I’m walking I’ll usually open the dumpster because I’m there anyways. Ville St Laurent I usually do on their heavy garbage day, which is the first trash day of every month. It’s treated me well in the past, and I may check out the Thursday route this week. 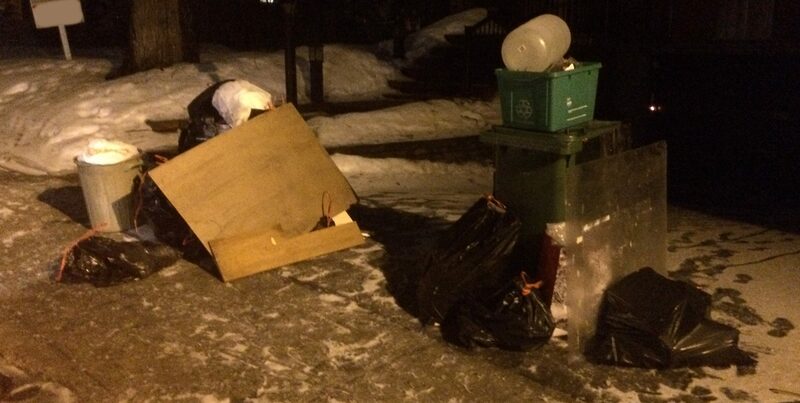 Ahuntsic used to be a poor route because of its garbage collection schedule, but now it should be fine because there’s only one garbage day a week (thanks to the new composting day). It may be that the person who stashed the money in various pockets wasn’t well, either from dementia or pre/post stroke. I saw this behavior with my father both before and after his stroke. I really like that you are responsible when you dispose of things you find but can’t ultimately use (like the digital frame). You’re leaving things better than when you found them. It’s possible. It’s a bit unusual that the cash was still in the shirts, you’d think that it’d have come out during a wash. So, maybe they were re-using the shirts. It wouldn’t surprise me if it was a relative who threw away this stuff. I just finished a book called “Junkyard Planet” which talks of the global scrap metal trade. It got me thinking more about recycling, and about how bad people are at it. So, I’m trying to pick up others people’s slack, at least when convenient. I had an idea too about a video about e-waste. If I actually get it done, I will share it here! American coinstar machines will let you get gift cards for no fee–we get Amazon and keep our kitties in canned food. Not an option in Canadaland? Unfortunately not, I would take Amazon gift cards over coin rolling any day. I know you are more interested in estate or cool vintage finds, but if you google Mom the ebayer and watch her old videos of her actually picking peoples garbage cans in Chicago you would be amazed. She regularly found gift cards, new clothes with tags and many useful household and cosmetic items, many new. In the winter, when tag or garage sales are not an option, the thrift stores can be a source of many good finds. Recently found an Iittala Solaris large bowl and platter for $3 and $4. Sold one for $50, keeping the other. Also 6 Iittala Ultima Thule b&b plates for $1 each. Will sell for over $50 Usually unmarked, but vintage pieces can be signed or have initials. The patterns are distinct, many look like snow or sleet frozen on glass. The pieces come with a little red dot I sticker that comes off so the stores don’t know what they are. Also saw on a U tube video that someone has a business that cleans out foreclosed houses for banks. He made 4 piles, save or salable, metal scrapping, toxic and garbage. In addition to being paid for his services, he made money on two of the four piles. He found silver and gold jewelry and lots of tools and man cave stuff. Very interesting idea I would never have thought of. Very interesting finds of cash. I would guess those shirts were all dry cleanable and just got tossed when dirty. This post should have been titled ‘FREE COLD HARD CASH”.That would have attracted many more new subscribers and readers to your post.Your writings are excellent;occasionally your blog post headings need to be more catchy. If you don’t want to pay the coin counter fee, I would suggest rolling pennies while watching TV or DVDs or while listening to the radio. I often do such jobs semi-mindless jobs while watching TV. That cash find is fantastic! The shirts the cash was in look pretty retro cool too. Do you have credit unions in Canada? The one we belong to has a free coin counting machine. Have you read “Garbology” yet? I am halfway through a copy that I found in the trash (oh the irony). It’s such eye opener. Keep up the good work rescuing treasures from the trash. You should write a book.